Atlanta Car Accident Attorney - Over 30 Years Experience! In a bustling metropolis like Atlanta, it’s no surprise that hundreds of motor vehicle collisions and accidents occur every day. The Georgia Department of Transportation recorded 1,554 crash-related fatalities in the state in 2016. This is an increase from 1,431 in 2015 and 1,170 in 2014. Motor vehicle accidents can happen in a split second – just one moment of driver inattention or delayed reaction to changing roadway conditions. If a Georgia highway, rural road, or railroad was the setting of your recent motor vehicle accident, contact the Atlanta car accident lawyer team at Butler Wooten & Peak LLP at (404) 321-1700. You may be eligible to recover for your damages. It’s easy to forget how deadly vehicles can be. Through years of driving, we become desensitized to the fact that we’re operating weapons. This can lead to unsafe habits like texting and driving, drinking and driving, and drowsy driving. Many drivers overestimate their abilities behind the wheel and risk the lives of others in moments of carelessness. Every year, unsuspecting drivers and their passengers sustain serious to fatal injuries in car accidents. If you or someone you love has been in such an accident, call Butler Wooten & Peak LLP. Your financial future may be on the line. How Many Vehicle Fatalities Happen Each Year in Georgia? The type of auto accident does not matter. What does matter is whether you choose to pursue compensation. If a negligent party is responsible for your accident, even in part, you should consider a personal injury claim. With the right team of attorneys, the process is simple and straightforward. Your lawyer will file the paperwork, navigate the red tape, and get your case underway without delay. The sooner you talk to an attorney, the sooner you can start your journey toward recovery – physical and financial. Past and future medical expenses. The costs of ambulance transport, hospital stays, scans, x-rays, medications, treatments, surgeries, and therapies relating to the accident. If you require lifelong medical care, such as a live-in nurse, the courts will award an amount to cover these significant costs. Lost wages from missed time at work. If you had to stay home from work because of your injuries, like in the case of a spinal cord injury, the courts will compensate you for this lost income. This includes compensation for raises or promotions you likely would have received were it not for your injuries. Property damage. Economic damages may also include losses to your property, such as your vehicle, home, or possessions. The courts will order an amount to repair or replace your damaged items, according to price estimates and quotes from experts. Georgia currently has no cap on the amount of general or special damages auto accident victims may receive. The court will take the amount of special damages a person suffered in a car collision and multiply it by a number (typically between one and five) it believes quantifies the amount of suffering the victim has gone through to come up with the amount for general damages. For a more accurate representation of what damages you may be eligible to recover after a car accident in Atlanta, speak to our attorneys. According to the data above from the Georgia Governor’s Office of Highway Safety, you’ll see that the total of vehicle fatalities in 2016 was 1,554. This is the highest it has been in 6 years. From 2014 to 2015 the total increased by 22.85%! And then going from 2015 to 2016 there was an increase of 8.67%. 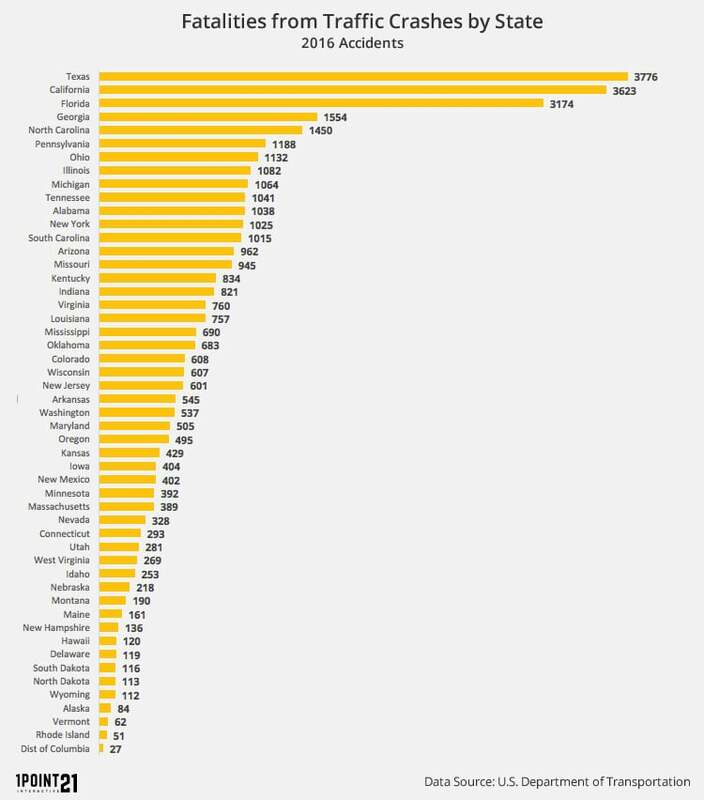 In the chart below, you will find a breakdown of the traffic fatalities by state in 2016. Georgia is ranked #4 highest in traffic deaths, with a total of 1554 fatalities during the year. Fulton County currently Leads the State in Motor Vehicle Deaths. According to the 2015 data, there were 104 vehicle-related deaths. Here’s a county breakdown of the years 2014 and 2015. The car accident claims process looks different in every state and even from city to city. In Atlanta, you must contact the Atlanta Police Department if you’re in an accident that results in more than $500 in property damage, injury, or death to any party. You must stop at the scene and exchange information with the other driver in all other types of crashes, although calling the police may not be necessary. Car insurance requirements. Every vehicle operator in Atlanta must carry car insurance policies with at least the minimum requirements. These are $25,000 for bodily injury to a single person, $25,000 in property damage, and $50,000 for bodily injury to multiple people. Fault system. Georgia is a “fault” car accident state, meaning that insurance companies will determine fault and liability after a crash before supplying coverage. The at-fault driver will be responsible for injuries and property damage that result from the wreck. Modified comparative negligence laws. Georgia obeys a modified comparative negligence rule, which means an injured party may still recover damages even if he/she is partially at fault for the crash. If the courts find the plaintiff 50% or more at fault, however, he/she loses eligibility for damage recovery. Damage caps. There is no statewide cap on compensatory damages, but there is a $250,000 limit on punitive damages. These are damages the court awards to punish the defendant for egregious acts such as gross negligence or intent to harm. Deadlines for filing. As stated above, you have two years to file a personal injury claim in the city of Atlanta. After the statute of limitations passes, the courts will refuse to hear your auto accident case. I don’t feel injured. Should I still seek medical attention? In our experience, we’ve encountered clients who did not notice injuries right away – even serious injuries like concussions. Sometimes injuries do not show immediate symptoms. We recommend seeing a doctor as soon as possible after an accident, just to be safe. Immediate medical attention can improve your prognosis for recovery and protect your rights should you later need to file a personal injury claim. The other driver’s insurance company has contacted me. What do I say? If the other driver was at fault for your crash, you could hear from his or her insurance company as soon as the day of the accident. The company may request that you give a statement about the accident. You may also receive a swift settlement offer. Insurance claims adjusters often know less about the crash than you do. They simply want you to settle for the least amount possible. Go over your other options with a lawyer before accepting rushed offers from an insurance company. Can I do anything to improve the outcome of my case? After a car wreck, you can take steps to protect your rights for the future, such as not admitting fault. Take photographs of your accident and injuries. Gather information, such as the other driver’s name and insurance company. Seek medical attention for injuries right away. Report the accident to police and to your insurance company. Contact an attorney as soon as you’re able to discuss your case. If you’re considering a personal injury lawsuit, your first question might be how much you could potentially receive in compensation. While there is no secret formula for calculating this, an attorney can estimate what your case might be worth during a free consultation. It will depend on the cost of your medical care, ongoing treatments, and lost wages, as well as how much the accident has affected your personal life and emotional health. In Georgia, you have two years from the date of the injury or discovery of injury to file a car accident personal injury claim. This deadline does have exceptions in certain situations, and there are tighter time limits for government claims (you must file an administrative letter, typically within six months). We recommend you don’t wait until the end of your time limit. Get started right away, while the evidence is still available and the memory of the crash is still fresh in your mind. I crashed into a company-owned vehicle. Who pays for my damages? If your car accident involved a business vehicle, on-duty employee, or a government agency, your claim may be against the company or entity, not the individual driver. Companies are vicariously liable for the actions of their employees while at work. You may also be able to file a claim against both parties, and/or another third party. Motor vehicle accidents can have a number of different defendants depending on the circumstances of a crash. A public bus crash, for example, may come down to the bus company’s liability, or the municipality in charge of the bus system. A train accident may be the fault of a negligent conductor, the train company, or a worker that left tools on the tracks. An Uber crash might be the company’s fault, or you might have to file your claim with the individual driver’s insurance company. There’s no end to the possible defendants in motor vehicle accidents in Georgia. To successfully bring a claim and maximize your odds of recovery, retain capable Atlanta attorneys. You will have to identify the defendant(s) and prove negligence to receive a settlement or award for your crash-related injuries. This may involve gathering evidence such as photographs, eyewitness statements, medical documents, and expert testimony. Our firm has years of experience helping clients prove claims and assign liability to negligent parties for motor vehicle accidents. No matter how complex your case gets, we have the power to handle it. What if I was partially at fault for the crash? Some car accident cases involve contributory negligence – the plaintiff’s proportion of fault in causing the collision. In Georgia, you could still recover for your damages even if the courts believe you are partially responsible. You will receive compensation reduced in proportion to your percentage of fault. For example, if the award amount is $100,000 but the courts find you 10% at fault, you would receive $90,000. I was in a hit-and-run car accident. Can I still recover compensation? If you have uninsured/underinsured motorist insurance coverage, this protection will cover your damages in the event of a hit-and-run accident. If you do not have this coverage, there is a chance an investigation will lead to identifying the driver. Police officers may be able to do this using surveillance footage or eyewitness accounts. Unfortunately, there is a chance you won’t recover compensation if neither of these avenues is fruitful. My loved one died in a car wreck. Can I sue the responsible party? That depends. In Georgia, the only parties who can file wrongful death claims are the deceased person’s spouse or children. If these parties don’t exist, the surviving parents may file. A personal representative of the estate may also file. Speak to our lawyers if you’re unsure whether you’re eligible to file wrongful death on behalf of a deceased loved one. Is a personal injury claim worth the time and money? In most cases, yes. The personal injury attorneys at Butler Wooten & Peak LLP work on a contingency-fee basis. This means you won’t pay anything unless we win you financial compensation. We take our attorney’s fees out of the award we win for you. Depending on the extent of your injuries, a personal injury claim can go a substantial way toward covering your expenses and making up for personal losses. After a car accident in Georgia, you may have dozens of questions on your mind. Meanwhile, you’re trying to recover from injuries, deal with insurance companies, and keep track of the mounting medical bills. Talking to an attorney can put your mind at ease and help take the burden off your shoulders. Giving your claim over to our attorneys means that our firm will do the legwork for you while you focus on healing. 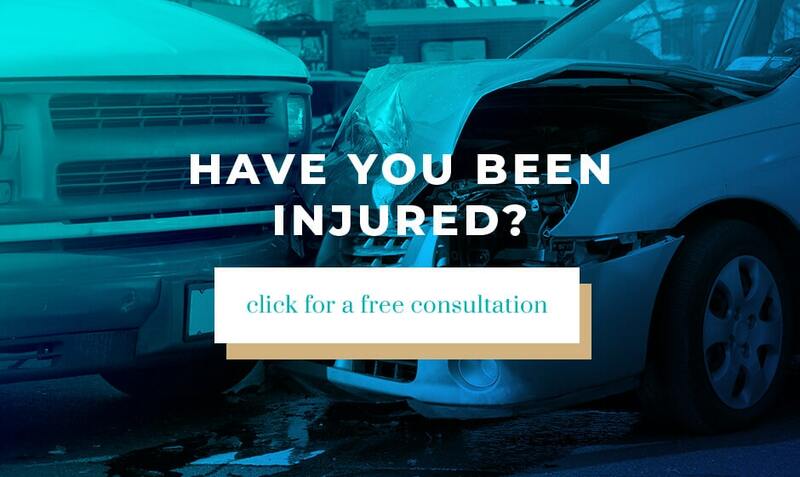 Contact an accident lawyer on our team and get answers to your specific questions. Speak to an attorney for free in Atlanta at Butler Wooten & Peak LLP. Car accident cases can quickly escalate into complex legal battles. A lawyer can take care of the legal processes for you, so you can focus on time with family and friends during your physical recovery. Our lawyers are happy to discuss your case in detail, give you an estimate of what it may be worth, and start the process for filing as soon as possible. Call us in Atlanta (404) 321-1700 or toll-free (800) 242-2962 or get in touch online for a free consultation today!